Melbourne entertainment facilities, stadiums, grounds and complexes. AAMI Park | Melbourne Rectangular Stadium Along with Melbourne Park and the MCG, AAMI Park (Olympic Park) is a vital part of Melbourne's premier sporting precinct. Victoria's burgeoning rugby ..
Akoonah Park is Crown Land reserved as a Show Ground and Recreation Reserve situated on the eastern edge of Berwick adjoining the Cardinia Creek. The area of 11 hectares has been developed by the v ..
Albert Park Indoor Sports Centre for netball and soccer! The Centre is open 6 days a week, from 10.00 am to late. The Centre runs competitions for all age groups, and courts are also availabl ..
Austadiums is a website containing information on every major sporting stadium in Australia and New Zealand, with everything from general information, photos and seating maps, to past/future events, c ..
Bairnsdale Racecourse lies in a fantastic position in the town of Bairnsdale in the East Gippsland region of Victoria. The circuit is approximately 3.5 hours drive from Melbourne along the Princess Hi .. The Ballarat Exhibition Centre is an exciting undercover events and exhibition Centre based in Ballarat in Victoria. A floor area of in excess of 4000 square metres undercover showroom area, 2,500 .. 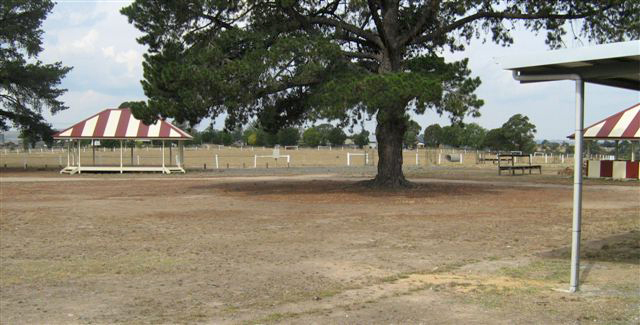 The Ballarat Showgrounds is a multi-purpose venue in Wendouree owned by the City of Ballarat and since 1934. The Ballarat Agricultural Show Society held its first activity on 10th July 1856. It was .. Located just over an hour's drive from Melbourne, Ballarat Turf Club provides a country atmosphere with metropolitan quality. Racing is held all year round on a turf track. Ballarat has 28 race meets ..
Balnarring Racecourse & Emu Plains Reserve Balnarring Racecourse is set within the Emu Plains Reserve. The 62 hectare site is decorated by a sweep of messmate forest that protects the 80 year old c ..
Beckley Park is Geelong's home of greyhound racing along with the first-class Beckley Centre and a weekly Saturday market. For the premium greyhound racing experience the brand new state of the art ..
Bendigo's new multi-million dollar Exhibition Centre is the largest clear-span facility of its kind in regional Australia. The Centre is located less that 3kms from the CBD at the Prince of Wales .. In 1998 the Bendigo Racecourse track was reconstructed and now the race course has a circumference of 1,995 metres and a straight of 400 metres. There are two starting chutes on the track, one hol ..
Bendigo's Prince of Wales Showgrounds which opened in 1968 on an 18 hectare site in Holmes Road is one of Regional Victoria's largest showgrounds. At five acres in size and with a one kilometre fen .. The ideal venue to host major sporting and entertainment events with seven indoor sports courts, major exhibition and function areas. The Bendigo Stadium attracts over 10,000 patrons each week for ..
RMIT Sports Centre, also known as Bundoora Netball & Sports Centre (BNAS), provides a wide range of sport and fitness options for RMIT students and staff. Our extensive facilities are used by local ..
Burnley Oval and Burnley Park covers more than 6 hectares, overlooking the Yarra River. The park's spacious grounds contain a formal barbeque area, a sporting oval with a pavilion and plenty of ope ..
Casey Stadium - the City of Casey's Indoor Leisure Centre Casey Stadium is a state-of-the-art indoor sporting venue servicing the community of Casey and the South East Melbourne region. Casey .. Ideally positioned just eight kilometres southeast of Melbourne city, Caulfield Racecourse has 20 racedays fixtured feature race days. Affectionately known as "The Heath", the course is readily ac ..
Clunes Showgrounds is 8 acres of land, with a variety of sheds, is suitable for many gatherings, from family reunions to birthday parties to caravaning get-togethers. The Kitchen Ideal for meal ..
Cranbourne Races & Racing in Victoria Cranbourne Race Course Cranbourne is unique - each year it holds a special tricode raceday of gallops, trots and dogs. In total, 23 races are run on the da ..
Greaves Reserve is also known as the Dandenong Showgrounds - home to Melbourne's second largest agricultural show that is held annually in November. A variety of sporting clubs - netball, footbal ..
Dandenong Stadium is located approx 30km from Melbourne is a popular venue for sport & other major events. Featuring 10 basketball courts, 7 volleyball courts & 3 beach volleyball courts, the venue at ..
YMCA's Darebin Community Sports Stadium has a range of sporting facilities including four court stadium, mezzanine hall and a multi purpose room as well as outdoor netball and tennis courts. With .. The Darebin International Sports Centre (DISC) is home of the State Lawn Bowls Centre, State Cycling Centre and State Football Centre. The centre hosted the Lawn Bowls Competition in the Melbourne .. The Eastbank Centre contains the Eastbank Auditorium, the Function Rooms, Alex Rigg Meeting Rooms and the Shepparton Art Museum Welsford Street, Shepparton, runs north/south and is one street over, ..
FedSquare is Melbourne's favourite meeting place as well as a unique cultural precinct which brings together a creative mix of attractions, museums and galleries with its many restaurants, cafes and b ..
One of Melbourne's original entertainment venues, Festival Hall hosts a variety of events, from amateur boxing to top-name band performances with an extremely versatile and adaptable physical layout. ..
Flemington Racecourse is one of the oldest and most beautiful racetracks in the world and home to Australia's most famous horse race, the Melbourne Cup. Flemington Racecourse is located on a flood ..
Recreation Reserves - Foster (Showgrounds) Foster Showgrounds is home to a number of sport and community groups including: Foster Agriculture Show Foster Basketball Club Foster Football Club .. The Geelong Arena is a multi use Sports and Entertainment venue, host of a wide variety of high class events. The venue houses four purpose built basketball courts, inclusive of the Showcourt/Audit .. The Geelong Racecourse is a major regional horse racing venue in Geelong, Victoria, Australia. It is 75k ms south-west of Melbourne. The current Racecourse dates to 1908. The annual Geelong Cup is .. Established in 1954 the Geelong Showgrounds is a regoinal multi-purpose community, recreational and event facility. Located on an 35 acre site on Breakwater Road, the Showgrounds is home to the la ..
Kardinia Park (GMHBA Stadium) is located in Geelong, making it Victoria's only venue outside of Melbourne CBD. 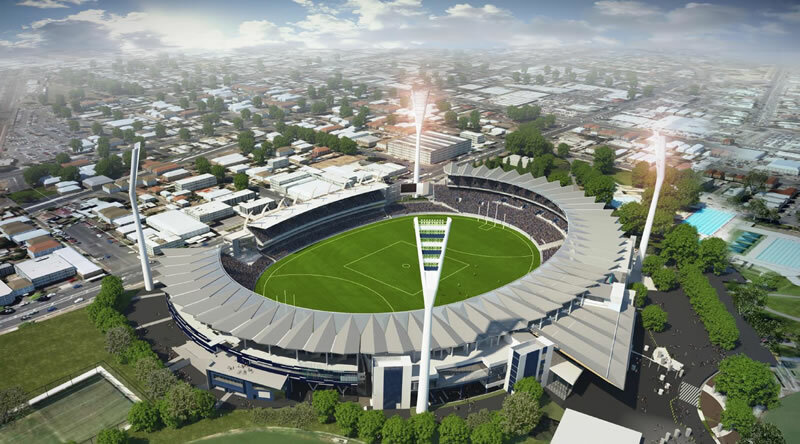 With a 36,000 capacity, it is the home ground of the Geelong Football Club that began .. The Hamilton Showgrounds is a 12 hectare site located less than a kilometer from the Hamilton CBD. In addition to the Hamilton P & A Society Offices the Showgrounds houses the Hamilton Exhibition a .. Hanging Rock Racecourse is located at South Rock Woodend VICTORIA. Hanging Rock hosts the biggest Australia Day race meeting in Victoria, such has been the emergence of the day in recent years. ..
Healesville Racecourse, Healesville-Kinglake Rd, Healesville The members and committee invite you to spend a day at the Healesville picnic races this season. Our club operates to promote thorou ..
Heathcote Showgrounds Reserve Park Caldwell St & Chauncey St, Heathcote South Home of The Heathcote Wine and Food Festival .. The Holden Centre serves as a centre of excellence for professional organisations and elite athletes. Home to Collingwood Football Club (AFL), the Holden Centre was previously known as the Swimmin ..
ice HQ is an indoor Ice Skating Rink / Arena located in Blake Street Reservoir. Melbourne's newest ice skating rink! Once Puckhandlers inline hockey stadium, it has been transformed into a stat ..
J J Holland Park is named after John Joseph Holland, a former Labor parliamentarian who campaigned for the development of social welfare schemes. Holland Park, as it is commonly called, is freehol ..
Kilmore Racing Track is known for it's evident in the Turf Track, which boasts one of the toughest layouts and uphill runs in thoroughbred racing in Australia. 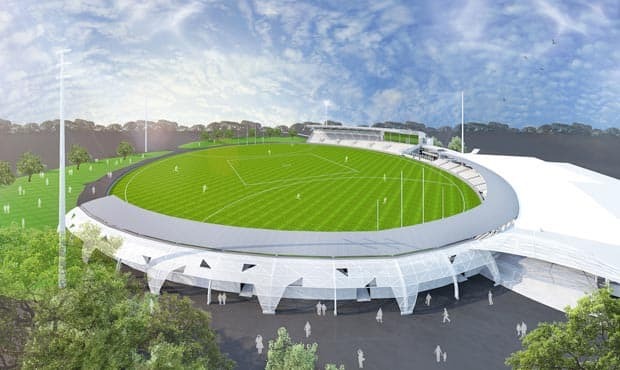 In particular, the home straight run ..
Kilsyth Sports Centre at Pinks Reserve Major sporting precinct with indoor stadium and ovals. A regional netball facility is under construction. Regular badminton, netball, table tennis, basketb ..
Kingston Agricultural Society Inc & Show Grounds Werona - Kingston Road, Church Parade, Kingston VIC 3364 The Kingston Agricultural Society Inc. at Kingston, Victoria, Australia, had its origin .. The Knox Regional Sports Park is the newest sports and recreation centre in Wantirna South and was officially opened in 2012. The 27-hectare site adjacent to EastLink has become a new home for the .. Known locally as simply Kooyong, Kooyong Stadium was the orignal venue of the Australian Open (tennis) along with many other events, including some of the biggest names in rock music. Celebrated a ..
Kyneton District Racing Club is situated at the Kyneton Racecourse in Kyneton Victoria. The race track is 1,616 metres in circumference with a straight of 250 metres, a relatively short straight an ..
La Trobe University is one of Australia's foremost higher education providers with aspirations to be the nation's preferred University for sport teaching and research, and industry collaboration to dr .. Opening in 1965 as Sandown Racecourse, today'' Ladbrokes Park also enjoys a growing reputation as a first-class function and event centre. The multi-faceted Ladbrokes Park showcases horsepower at i ..
Victoria's new home of athletics, Albert Park's Lakeside Stadium, is up and running and ready for testing following the completion of the athletics competition facilities, which includes a world class ..
Lardner Park is one of Australia's premier regional exhibition venues and home to Farm World, country Victoria's largest agricultural event. Located 1 hours drive east of Melbourne, Lardner Park ha ..
Laurens Hall reflects the authentic and unique nature of its location in North Melbourne for Receptions, Creative Arts, Photography, Film Settings, Product Launches, Conferences and gatherings for pri ..
Lilydale Agricultural & Horticultural Show Society Lilydale Showgrounds Market St Lilydale, Melbourne, VIC 3140 ..
Margaret Court Arena (MCA) is the third retractable-roof stadium at Melbourne Park. 'Show Court One' was built in 1988, the year the Australian Open Grand Slam tournament moved from Kooyong to its ..
Eureka Stadium (Northern Oval) is a football ground in Ballarat Showgrounds at Wendouree. The Eureka Stadium is owned and operated by the City of Ballarat. Construction of a new playing surface .. Located in the heart of Melbourne, Marvel Stadium (was Etihad Stadium) has welcomed more than 35 million fans through the gates since opening in 2000. Renowned for regularly staging AFL, A-League a ..
Melbourne & Olympic Parks host an extensive range of events such as international tennis, soccer, rugby union, rugby league, athletics and cycling, dirt bike races, ice skating, music concerts and fam ..
Melbourne Arena (formerly Hisense Arena) A world class entertainment venue, Melbourne Arena holds an eclectic range of music concerts, family orientated performances and dance parties. Venue f .. The Melbourne Ballpark, also known as the State Baseball Softball Centre is the home of Baseball and Softball in Victoria. The State Baseball Softball Centre was opened in January 1990, by the Mini .. The internationally renowned Melbourne Convention and Exhibition Centre brings people together to deliver world-class events and create memorable visitor experiences. Leading technology capabilitie .. The Melbourne Cricket Ground (MCG) is an iconic Australian sporting venue located in Yarra Park, home to the Melbourne Cricket Club. The "G" is a stones throw and easy walk from the city centre, c ..
MELBOURNE INTERNATIONAL SHOOTING CLUB The Melbourne International Shooting Club (MISC) at Port Melbourne is the proposed site for the Small Bore and Pistol events. The venue is planning significant ..
A NEW state-of-the-art show court will be built at Melbourne Park in the next $270 million stage of the sports and entertainment precinct's redevelopment. Images obtained exclusively by the Herald .. Located centrally in the major events capital of Australia, Melbourne Showgrounds is Victoria's largest and most versatile venue, offering unique and flexible indoor and outdoor spaces designed to hos .. Attracting 2.95 Million patrons annually, Melbourne Sports Hub is one of the world's largest sporting destinations, home to hundreds of competitions, events and active communities. The State Sport ..
Moonee Valley Racecourse managed bv the Moonee Valley Racing Club is the historic home of Australia's most prestigious horse race, the Cox Plate. October every year features five days of racing eve .. Located only 45 minutes from Melbourne and at the gateway to the beautiful Mornington Peninsula, the Mornington Racing Club is a premier destination for thoroughbred racing, corporate entertaining and .. The National Tennis Centre is Australia's, and arguably the world's best purpose-built, elite tennis training facility. The National Tennis Centre is used as a training facility by the Australian O .. The National Water Sports Centre was originally developed in 1988 in preparation for the 1996 Olympic Games, for which Melbourne's bid was ultimately unsuccessful. Today, the 2000 metre rowing course ..
57 Mount Pleasant Street | Where?